Kithara Duo opened Guitar Fort Worth‘s 2011/12 concert season on September 9th, 2011. Fernand Vera and Olga Amelkina-Vera make up the husband/wife duo. Their concert opened with a short work by Olga: Prelude and Bagatelle. It was a restrained work, with a lot of beautiful harmonies. The next work, Los Buzos, was a originally a song by Fernand’s grandfather. This was the work where it became clear just how tight of an ensemble the Kithara duo is. There were times when you could not tell where one guitar stopped and the other started. Their tones, beautiful individually, matched perfectly as each player floated in and out of the melody and accompaniment roles of the song arrangement. Prelude and Fugue No. 4 in E Major, a selection from Castelnuovo-Tedesco’s Well-Tempered Guitars collection came next. Again, the tight musicianship shined here. Each voice of the fugue came in and out and necessary. If I could pick a word to describe this interpretation it would be deliberate: carefully thought out and executed extremely well. Two works by Alfonso Ferrabosco the Younger were next in line. Both pieces sounded very much like Dowland — contrapuntal, fun little works. An excellent follow up to the heavier Tedesco work. The first half closed with another work by Olga: Beings, a short suite meant to capture the essence of several mythical creatures. There are times when modern works for guitar make uses of extended techniques just to use them. That is, they don’t add any musical substance of value to the work in which their placed. Beings is not one of those works. Every effect added to the mood and created a beautiful, evocative sound scape that, combined with the composer’s remarks, accomplished exactly what the piece set out to do. Each movement, Minotaur, Sylphs, and Salamander very effectively conveyed the image of the being after which it was named. After intermission, the duo resumed the concert with Yurikago no Uta (Cradle Song) by Shin Kusakawa and Oborozukiyo (Dim Moonlit Night) b by Tei-ichi Okano. Both works were beautiful. Next cam Mallorca and Rumores de la Caleta by Albeniz. To be frank, I’m a bit burnt out on Albeniz. It’s been a large part of the program at every concert I’ve been to in the past year. That said, I would like to hear more Albeniz like this. The duo tackled Albeniz’s sectional forms in such a way that they flowed together better than any other interpretation I’ve heard so far. Another arrangement by Fernand, this time a medley of Irish and Scottish traditional music, followed the Albeniz. This was a fun piece, and some very creative arranging by Fernand made it a pleasant listen. The penultimate work was another prelude and fugue by Castelnuovo-Tedesco, this time in B-flat major. Again, super-tight ensemble playing made this work. The duo effortlessly handled the involved counterpoint of the fugue. The concert closed with Lo Que Vendra by Astor Piazzolla. Great playing here too, but I felt like it was a bit too restrained. More grittiness and energy would have added an extra element to close the program stronger. 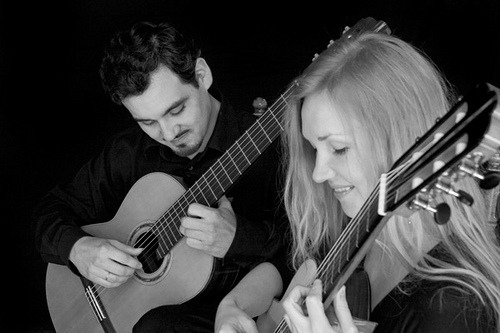 If you get a chance, check out the Kithara duo in concert. They are a great ensemble. If they don’t happen to be in your area, you can check out their Beings CD. It includes the work by Olga mentioned above.